We received a call from a youth pastor who wanted to thank us for giving him a new way to force his students to eat disgusting things. Yes, you read that right. And we just loved the idea! So many associate a prize wheel with…well, prizes. But what if those prizes were not really wonderful, life changing items but punishments, dares and horrible things to eat? Of course, you’re mind is probably already “spinning” as fast as ours (see what we did there?). But for this idea post, we’ll let the user submitted wheel do the talking. Anyone hungry? iPrizeWheel Campus Life Gag Factor (User Submitted) – We’re not sure we’d want to land on any of these! iPrizeWheel was recently spotted at a local AT&T booth before a Kent State football game, and we were really impressed with the set up. You can see that they are mirroring their iPad on an HDTV monitor which allows the crowd to watch while the spinner interacts with the app inside the booth. What a fantastic way to draw in a crowd! The idea for iPrizeWheel really came alive when Apple released the highly anticipated iPad 2. The complete redesign of the device also introduced a new feature: the ability to mirror anything your iPad screen on an HDMI connected device. Visions of having the iPrizeWheel displayed on 30″, 40″ and 50″ monitors became an instant reality and the concept really came alive. It’s a great way to pull in the crowds at events, where the iPad screen would otherwise be blocked by those interacting with the device. It’s a great way to amplify the sound effects in iPrizeWheel, most importantly, the clicking noise that we’ve all grown familiar with on the old fashioned spin wheels. In a classroom or group setting, people can follow what’s happening on the iPad even when the iPad is not facing them. You don’t have to hover around a tiny screen to see what’s going on. Apple’s HDMI converter which allows you to plug in an HDMI cable as well as the charger cord. This costs $39.00. Note: If you have the new iPad 4 with smaller Lightning connector, you will need a different accessory in order to output video (not shown in photo above): http://store.apple.com/us/product/MD826ZM/A/lightning-digital-av-adapter. The 30-pin to Lightening converter will not work with video output. An HDMI cord. Any one will work and you can get this at any electronics store. Make sure you get one long enough to reach your TV if you’re at an event. They come in various lengths. An HDMI compatible TV or computer monitor. Any flat screen TV will work as HDMI connectors have been out for many years now. Computer monitors also work but the price of TVs have come down so much, it’s cheaper to go that route. You can get some great deals on a 32″ TV for around $200.00 and we’ve found this to be a perfect size for various events. As a bonus, you can switch quickly to your website, show photos or more as this isn’t a function of iPrizeWheel as much as it’s a function of your iPad. If you’re at a event, and you don’t want to ship such a cheap TV home (shipping is expensive and we’ve had a few turn up damaged), just give the TV away as a grand prize at the end of the event. If you’re collecting data, this is a HUGE incentive for people to give accurate data as well as interact with your brand. BONUS TIP: Because iPrizeWheel is designed for the iPad screen, and not for an HDMI output, change your TV’s display settings to ZOOM or ZOOM WIDE so that it takes up the full length of your screen. You may loose a bit of your logo, but you’ll gain a bit more visability, which is what you’re after with the HD display. Here’s the poster they created for the table to spin and win! When we first released iPrizeWheel, we heard quickly from a teacher that downloaded the app and was using it in her class. Her students loved spinning the wheel on the iPad and she was able to quickly connect her iPad 2 to her HDTV monitor so the rest of the class could be in on the excitement. “Win A Prize” – Want to reward good behavior? Being on time? Getting a specific grade? Right answers during a lecture? Let your students spin the wheel for prizes. “Study Series” – If you have a series of topics in a specific study, why not make it fun and spin to see what topic you’ll cover that day? “Choose The Music” – For younger grades, this would be a great way to choose the playtime music in the classroom. Put the CDs on the wheel and spin to see what gets played that day! BONUS TIP: Do ALL THE ABOVE easily and switch in between wheels with just a few clicks. Premium users can create unlimited campaigns and toggle between them at any time. These are just a few ideas. There are limitless ideas on how to incorporate iPrizeWheel into the classroom. And the students will LOVE the technology and will come expecting fun when it’s time to spin that wheel! iPrizeWheel was recently spoted at a wedding show with over 1,800 vendors which poses the immediate question: How would you stand out and be remembered in such an enormous crowd? Collecting data from those who spin your digital iPad prize wheel is one of the biggest draws to the app. It’s a fantastic and easy way to get information from your guests, but there are a few settings you should change before any event to ensure a smooth process and a quicker line. In your iPad’s SETTINGS, go to GENERAL > KEYBOARD. On this screen, turn everything OFF. iPad’s default settings will auto-capitalize data, auto-correct it (a big pain for name and email entry), check the spelling of entries, enable caps lock and include shortcuts. You don’t need any of these interferring with the job at hand: getting the data correct and fast without any frustration from your spinners. Check out this post’s category for more tips and tricks. 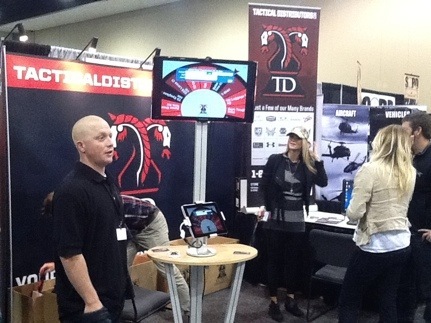 We were excited to find this photo online of iPrizeWheel incorporated into a trade show booth. You can see that they have their iPad connected to an HDTV monitor elevated above the crowd so that it really pulls in those passing by. Great set up!